1) Identify the specific learning standards, anchors or objectives. Start with the end in mind. Of course, we’ve all heard of the backward design model. However, this is a crucial question step that will guide the approach to other questions. When choosing objectives, make sure they are higher level objectives. Having students research information on a topic, put it into a PPT, Prezi, Poster, or any other presentation tool, isn’t very high level if they aren’t required to “DO SOMETHING” else with that information. For example, I use to assign a ‘President Project’ which required students to research and present a ton of information on an assigned U.S. President. The presentations looked cool, but all they accomplished were students proving they could find and present information. There was no evaluation, synthesis or higher-level thinking required. It was like a fancy book report. Very little meaningful or challenging learning was accomplished. Instead of having students research information and report it in some way (almost the equivalent of finding a pile of rocks and moving them from one side of the road to the other), have students answer a question based on their research. Have them evaluation the research or synthesize data or information and then answer a question or solve a problem. The big question is: What are students required TO DO with the information? If the answer is just, report it out using a fancy presentation tool, then it doesn’t meet criteria for a quality project. 2) Create an assessment criteria. What will be assessed? How will it be assessed? How much point value will be assigned to this project? There are a few things to consider here. First, make sure you are assessing the identified learning objectives. Often times, teachers attribute points to cover pages, neatness, effort and other areas that are not aligned with the actual learning objectives. We can teach teach and model these things, but we need to make sure we are assessing and grading are the actual learning objectives. This is not to say that some point value cannot be allotted for things like neatness of a presentation, but it should be a very small percentage, as that usually was not the goal of the learning. If neatness, presentation skills, organization, design, etc will be assessed, be sure you have taught and modeled the skills. We cannot expect students to meet expectations for these elements, if we have not made them clear. It’s not really fair to grade things we don’t explicitly teach. Second, the number of points should be somewhat relative to the number and level of learning objectives the project assesses. Is it fair to give a 100 point test, which assesses 10 learning objectives, then assign 100 points to a project that only assesses three? This is something to consider when setting a point value. Just because it takes a week, doesn’t mean it must be worth more points. Try to find a balance. A clear rubric can help. Create a rubric that breaks down the assessment of learning objectives and sets values for different levels of mastery. Review the rubric with students and ask for their feedback prior to finalizing. You can also allow students to help create the rubric. I never did this as a teacher, but wish I would have. I learned about this idea last year and have heard of some great approaches and examples. One would be, to start with a project exemplar/model that would normally earn a “C”. Have students give input on what would improve it to a “B” and an “A”. Document and create the rubric based on their feedback. There are other ideas, but that is just one. Discussing, and not just reviewing, the rubric prior to giving to students to begin their projects is extremely valuable to improve clarity of expectations. The timeline should be relatively based on the number of specific learning objectives the project will assess, and somewhat on the assigned point value. For example, if it only assesses two objectives, a three-week timeline is probably not appropriate. This was definitely an area in which I grew a lot over time. Some of my early projects would take weeks, yet only measure a couple, low-level objectives. Be sure to consider this when designing a project. Should this project be individual? Partners? Groups? Ask yourself, what are the benefits of each option. Make sure there is some rationale for your decision. For example, are there four somewhat equal parts that each student can do, and you can assess individually? If so, place the students in groups for four. When assigning group projects, make sure their are roles for each student that hold them accountable to the learning. This will not always be perfect, but one student should not suffer, or be rewarded, for the work of another. 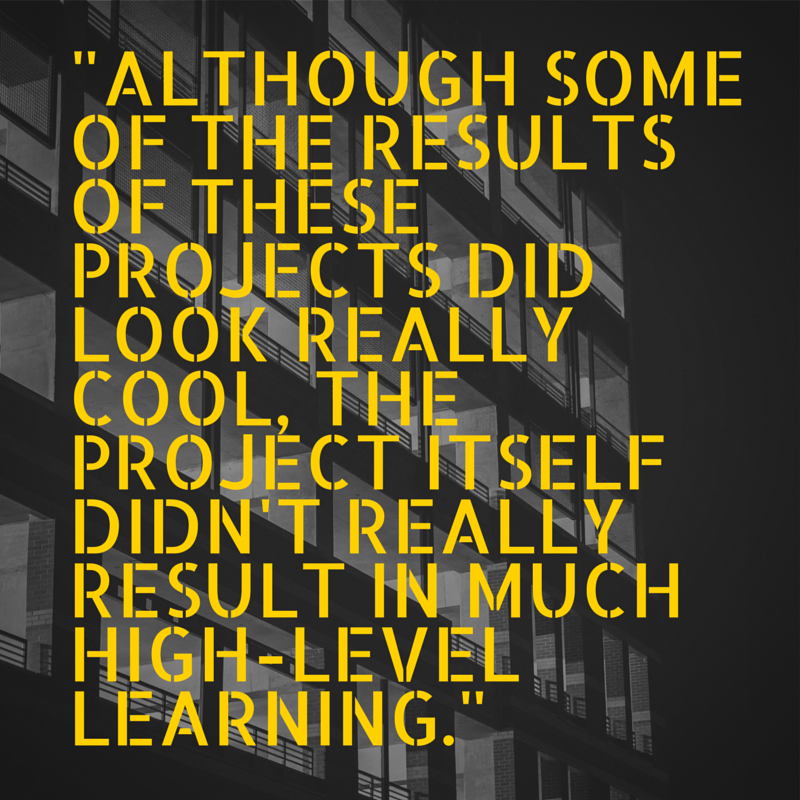 Individual assessment and fair grading are usually some of the biggest challenges to designing group projects. 5) Evaluate the need for Differentiation. Projects lend themselves to differentiation. Differentiation should be based on student readiness, interest, or learning style. Differentiating the product is a good place to start… When assigning a question for students to answer, or a problem to solve, the available options for students to show their knowledge are many. Allowing students to choose their product is one way to differentiate. As the teacher, you can provide some options, but also allow for student choice. You can also differentiate content by assigning a series of questions, or problems, students can choose to answer or solve. Remember, WHAT (content, process or product) you differentiate should be based on WHERE your students are (readiness, interest, or learning style). A differentiated project increases student engagement, when it is appropriately rigorous and allows for student choice. Designing a project is hard work. While students work with their groups, it is tempting to spend this time catching up on other things: finally grading the papers put on hold while preparing this learning experience. However, this is when students need their teacher the most. It is imperative that we remain engaged with the students while they work on the project. In the design phase, brainstorm all of the mistakes or stumbles students might experience. Create a list of guiding questions to help keep the students focused and poised for success. If a project will last more than a few days, build in check points. “Elevator Talks” are a quick and easy way to measure group progress. Visit each group individually and randomly select one of its members. That student has approximately one minute – about the length of an elevator ride – to fill you in on their group’s progress. We recommend keeping these talks private, just you and the group. It will be important to model this experience with the class, first. Give an elevator talk about the previous day or a favorite TV show. Be sure to point out that the talk highlights the most important information, but saves the small details. Designing projects that meet the learning and interest needs of all students is always a challenge. Please share any ideas or insights you may have on the topic.